We're very pleased to announce that we have a new brand at Stylingup.com. French Connection is a well known fashion brand that offers a wide range of women's clothes, with very fashionable designs at great quality for price. This brand was founded in 1972 by Stephen Marks and it's a great pleasure to have this awesome brand in our website. Now, our stylists will also recommend clothes from French Connection for your body shape and size. Excited? We are!! Which other brands would you like to see at stylingup.com with recommendations from our fashion stylists? Are you guilty of packing five of everything when you go on holiday..and then wearing the same pair of shorts and flip flops every day? That makes about a million of us. To try and avoid this, I’ve put together a list of staple pieces to get you through any beach holiday in style.. and hopefully leave room in your case to bring back all the inevitable purchases of shell bracelets and sarongs! 1. You’ll probably be spending a lot of time in your bikini, so it’s important to take some that fit and flatter you and make you feel comfortable. The polka dot one (Topshop) is classic and feminine, and the ruffles help to flatter hips. The red ruffled one (River Island) is more of a statement and is great for boosting small busts. 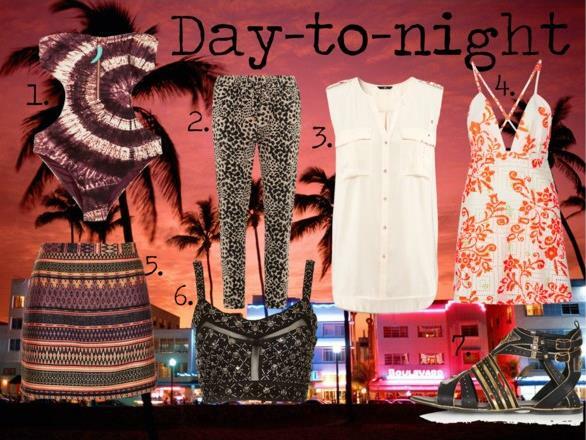 These are the hero items that will take you effortlessly from beach-to-dinner-to-bar. Hopefully these pieces will see you through your holiday easily, and leave you only worrying about what cocktail flavour to try next! It’s very eighties..but I’d recommend a Pina Colada. Happy Holidays! In the last seasons we saw bags becoming lighter and smaller and we’ve seen them all across the red carpets. Right now clutches are a must-have on every women’s wardrobe. It’s a great accessory not only to wear on parties, cocktails or evening events, but also to wear on a day-to-day basis (especially for those who don’t have to travel around by bus or underground). Clutch bags may seem small, but they are just the right size to carry around the most indispensable things without carrying any extra weight or tons of papers and things that are often forgotten on big shoulder bags. Below, you’ll see our stylist selection of the top 10 clutches on the high street. These are great, classy and affordable options for those who like to keep up with fashion without spending a large amount of money. Styles range from classic to glamorous and creative and the prices range from £17 to £54 in brands like Accessorize, Monsoon, Steve Madden, Awear, Cat and others. Styling Up has teamed up with Beija Flor and we're giving a gorgeous silicone necklace to one lucky winner in the Styling Up's facebook page. To make sure you enter this competition, just go to our facebook page and click on the "WIN" tab. Please note that this tab is only available on Desktop version and it's not working on mobile. In that tab, after liking our page, you may comment by answering the question: "What would you wear this necklace with?" and pasting a link from the Styling Up's website. To increase your chances of winning, you can comment every day. Share this with your BFF's so they can also get a chance to win. You can also visit our website to see what our stylists recommend for your shape and size and Beija Flor's facebook page for more stunning silicone necklaces.